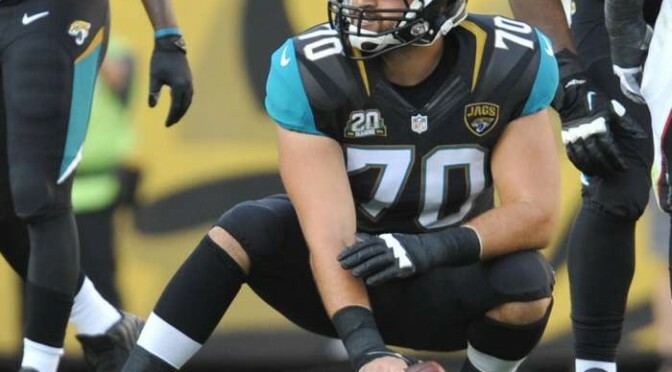 The Jacksonville Jaguars’ offensive line and quarterback Chad Henne had a rough game against the Washington Redskins. The 10 sacks given up was the most in franchise history and the team looked like it needed better communication and the players looked outmatched by the defensive line. The team made some roster moves yesterday to improve the situation. Most notably will be new starters Luke Bowanko and Sam Young at center and right tackle, respectively. I was a big fan of Bowanko through the preseason and thought he would get the nod over Jacques McClendon (who he is replacing) to start the season. After two weeks of McClendon underperforming Bowanko will be able to show that his preseason success was not a fluke. I think that the sixth round draft pick will be able to hold up better in pass coverage, providing more time for Henne. More importantly, however, I believe that he will be able to get a better push for the running game which still hasn’t managed 100 yards over the course of two games. Toby Gerhart, Denard Robinson, and Jordan Todman desperately need to have some blocks to get things going. Bowanko should be an immediate upgrade. With Bowanko and Young on the line against the Indianapolis Colts, we should see some better play along the offensive line. The unit will have to gel quickly, however, otherwise there may be some communication issues and missed assignments like we have seen in the past few games. I am hopeful they can get on the same page quickly, especially Luke Bowanko as he has played well with the unit over the preseason.